Sometimes an animal comes into your life when you least expect it. 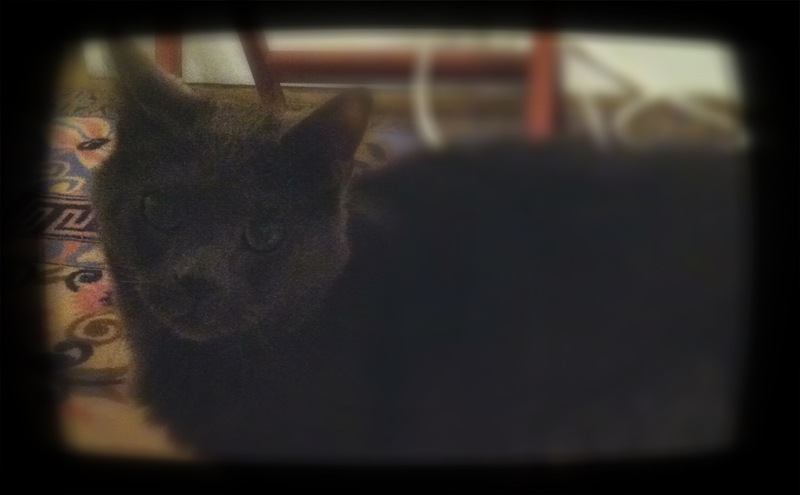 Take, for example, my cat Smokey. Almost four years ago my wife and I were approached by an elderly lady who lived next door to the school where we worked. She was going into a nursing home and wanted to be sure that her 5-year old Russian Blue would be well looked after. We had been discussing adopting a pet for some time, but always disagreed on what our pet should be. I’d always grown up around dogs; cats were for living outside (most of the time) as a type of natural pest control. My wife, however, dislikes dogs with every fiber of her being. We were now presented with the option of taking in a cat that we had never met, but who was already fixed and (supposedly) house-trained. We said yes. Smokey arrived in one of those cheap plastic carriers that retain the smell of the first thing ever put in it. In this case, it smelled like sick cat. We carried him to the vet to get a checkup and picked him up after school. He meowed and threw up for the entire 20 minute drive. Smokey’s first introduction to our home was the bathroom. We set up some food and water and a litter box for him and let him out of the foul carrier, which I immediately disposed of. Smokey immediately ran behind the toilet and refused to come out if he knew we were watching. Then there was the issue of house training. Apparently, Smokey was not well-looked after in the litter department and had taken to peeing on any plastic bag he could find. We found this out the hard way after he peed on a bag of gym clothes we had left in the bathroom to be washed. Once we removed all plastics and clothing from our spare room, he soon learned to use a litter box. It was after Smokey settled down and became used to our routine that I realized something: Smokey thinks he’s a dog. Now I know the difference between a Russian Blue and many varieties of canines, but apparently no-one ever informed Smokey. He’s the first cat I’ve ever known (and I worked in an animal shelter for several years) to actually enjoy water. He only drinks running water from our bathtub. He tried to get into the shower with me in the morning. He one jumped in the bathtub while I was drawing water and stood in it as the water came up to his knees. Once, he even managed to turn on the water all by himself. He gets into mischief, especially when it comes to trash. Now, dogs will mainly go after trash that has some kind of food or food scent on it. Smokey takes it further. He will drag trash out of the trash can simply because it’s in the can. We had to try three different animal repellent sprays to find one that actually bothered him. Now we spray the trash can every time we throw something away. Now don’t get me wrong: Smokey loves food. He loves it a lot. He’ll eat for the sake of eating. He loves food so much he’s managed to open a cabinet door, knock over his food container, and paw at the lid until it opens. He tries to eat our supper before we’ve even finished cooking it. He climbs into the kitchen sink to lick plates that have already been rinsed (and sometimes even washed). Smokey is also a guard cat. Any time someone pulls into our driveway, he’ll meow once and then sit patiently by the door. If there are strange noises outside (and, given our neighbors, there are strange noises at all times of the day and night) he’ll wander around the house trying to find out where they come from. And, he keeps our house relatively free from pests. Spiders, bees, beetles, bugs, lizards, and tree frogs have all been killed (or chased out the door) due to his keen hunting capabilities. In fact, this afternoon I saw him stalk a bee that came in with us after work, jump at least three feet in the air, and kill it with one blow. He’s also a people cat. Any time anyone is sitting down, he tries to be near them. If they’re resting on the couch, he has a burning desire to be on top of them. If I try to chase him off, he’ll simply sit on the back of the couch. So, after four years, I’ve come to a conclusion. When Smokey came into my life he wasn’t the cat I would have chosen, but looking back he’s exactly the cat I needed.